The Reinsman Tacky Too Contoured Square Saddle Pad is a great choice for an everyday use pad with the added benefit of a contoured shape so it’s a natural fit against the horse. The Tacky-Too® bottom that is a soft, non-slip material that is anti-bacterial, ventilated, pressure distributing, shock absorbing, and deceptively tough and durable. Inside is comfort felt to absorb shock. Channel on inside for spine relief. MicroSuede is truly a scientific material, has fibers that are many times smaller than human hair. This tightly woven construction gives the saddle pad unparalleded softness and amazing resistance to wear, stains, and moisture. When these great colors are combined with its ability to absorb vibrant dyes, there’s no doubt why this material is been favorite for years. Herculon is constructed from a fiber created in 1957 that resulted in a Nobel prize for its invention. At the time, it was considered a miracle breakthrough in the textile industry. Today, it continues to be on of the most widely used performance fibers in the world. Its lightweight non-absorbent construction is abrasion, stain and UV resistant, making it a perfect fit for saddle pad construction. Matrix is the latest woven look from the Herculon fibers. The non-absorbent construction is abrasion, stain and sunlight resistant. It utilizes yarns of many different colors to achieve a basket like effect up close while taking on more of a textured solid look from a distance. This is the second one that I have. Holds up great fits both the miue and foxtrotter great. Would buy again. The Reinsman tacky pad is wonderful. 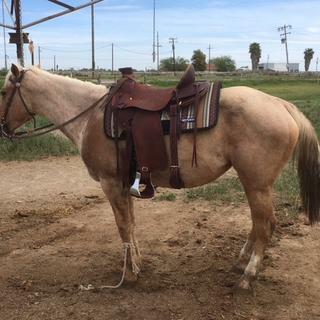 My saddle stays in place and it looks great on my horse. After reviewing several types, I found this pad and I am glad I bought it. Fits my horse perfect and looks great. This is the 3rd Reisman Tacky Too Contoured Square Pad. It is heavy duty / durable. It comes is great colors and patterns. I bought this product so I can ride my horse with my new saddle as my previous saddle pad was too small. I was worried when I got out this saddle pad as it is much thinner than expected. However, this saddle pad does provide support for my horse's back. He has not had any dry spots on his back since I started using this. My horse seems super comfortable. I think this is a beautiful saddle pad. I loved this pad so much, unfortunately I thought my Arab could use a 32" pad, but he needed a 30". So traded with my friend, other wise great quality, my fault. Wish state line sold pads in 30". I ordered this pad on the recommendation of a friend that really liked her pad. When I received it I was surprised at how dull the colors were compared to the image online. I ended up returning the pad and ordered one with much brighter colors. My friend has this one and I know I will like the color. The quality of the pad seems like it is made well. One feature that I like is when it becomes dirty you can spray if off on both sides. I have two of these, an older one they don't make anymore that had a wool blanket top and this one. Both my wife and I's horses like them. Her mare is really sensitive to anything scratchy on her back and has never had a single problem with these. They don't seem to slip riding around in the mountains around our house here in Montana. I wish they were a bit cheaper but then I wish that about everything tack related. I prefer this pad over any other that we have ever tried and it is what we always use now. Already have 3 other Tacky Too pads. They are great! This will be my 3rd Reinsman Tack Too Saddle Blanket. Fits great! Light weight. Wears good. Great for Hot climates' like Texas. These pads are great and NEVER slip. Will this fit a horse that does not have high wither ? BEST ANSWER: Yes this pad is made to be contoured to a normal shaped wither. It is not made as a padding device to fix confirmation flaws. I use one on my mare who has a relatively flat wither and my QH gelding that has a fairly normal wither. Fits both well, no rub marks and easily washable. Just hose down after work and hang to dry. I would think so but we do not have that issue. We absolutely love the saddle pad. Fits our horses great and great quality. My horse does not have high withers and it fits her pretty well. It should fit most horses, yes. what is the underside of the pad made of? Crow rust not showing as a color option, how can I order this pad in that color? BEST ANSWER: Unfortunately that is not an available color option. The ones that are will show on the drop down list to choose from.